Speaking on Sunday before a partially Iranian American audience at the Reagan Foundation in southern California, Secretary of State Mike Pompeo accused Iran’s leaders of stealing the country’s resources to spread revolution abroad and oppress Iran’s 80 million people. Why it matters: Pompeo’s heavily advertised speech was the biggest installment yet in a Trump administration information campaign designed to pressure and, if possible, destabilize the Iranian government. The details: In his most Reaganesque comment, Pompeo said that "the U.S. hears you, the U.S. supports you and the U.S. is with you" when it comes to the Iranian people’s aspirations for greater freedom and prosperity, as evidenced by recent protests in Iran. He claimed that the U.S. goal was for Iranians in Iran to achieve "the same quality of life Iranians in America enjoy." Yes, but: Pompeo neglected to mention that a major cause of Iranians’ current economic plight is the Trump administration’s decision to unilaterally quit the 2015 Iran nuclear deal after months of undermining its implementation. The "maximum pressure" campaign the administration is seeking to impose, Pompeo claimed, is directed at Iranian leaders. But ordinary Iranians have suffered most from the collapse of their currency triggered by the U.S. decision. He also downplayed concerns about the travel ban, recently upheld by the Supreme Court, which makes it extremely difficult for Iranians to travel to the U.S. to see family or attend university. 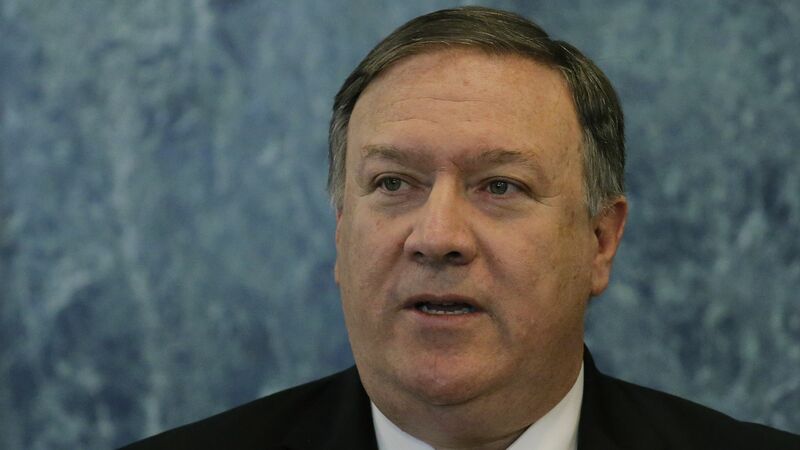 Some Iranian American organizations such as the National Iranian American Council (NIAC) boycotted the speech, accusing Pompeo of seeking to co-opt legitimate Iranian grievances. A NIAC–sponsored ad in the Los Angeles Times that was signed by a number of prominent Iranian Americans stressed that "change must come from inside of Iran — not from Washington or anywhere else." Iranian American organizations that sent representatives to the speech said they were doing so not to endorse the Trump administration’s policies but to use the opportunity to suggest improvements. The Public Affairs Alliance of Iranian Americans (PAAIA) sent this analyst a statement prior to the speech stating that Pompeo’s remarks "presented an opportunity for PAAIA members to directly inform the administration about the near unanimous opposition Iranian Americans have towards the travel ban as well as the importance of enhancing sanctions relief on telecommunication tools, food, and medicine for the Iranian people." The bottom line: Pompeo’s protestations of concern for the Iranian people fall flat at a time when the U.S. is an outlier on the Iran nuclear deal, other countries are resisting the re-imposition of sanctions and the Trump administration shows scant concern for equal if not more serious human rights abuses by other countries with which it has chosen to engage diplomatically — among them Russia and North Korea.